The yen has rapidly weakened in response to the latest instalment of Quantitative Easing by the Bank of Japan. We have seen this sort of thing before, and it will probably only matter for the financial markets. The alleged end to deflation in the real economy will be just a blip. The only hope for improved growth in Japan is the result of increasing export market share, which is only going to matter if importing nations are in a position to keep doing so. The excitement in the yen/dollar exchange rate matters if you have currency positions in place, but this sort of volatility is exactly what yen traders should expect. Other currencies tend to adjust in an orderly fashion, but you cannot extrapolate that behaviour to JPY. Oil prices are now going into reverse, and we cannot expect consumption taxes to be hiked every year. 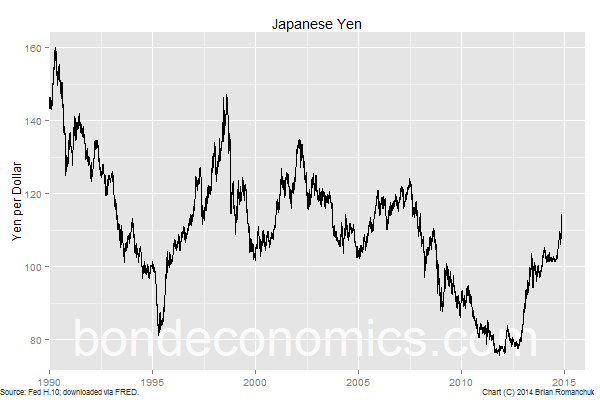 The only factor that is easily repeated is that the yen can continue to drop versus other currencies. However, given the large stock of foreign currency denominated assets held by the Japanese public and private sector, yen weakness can only go so far. Based on previous experience, outflows towards foreign currency assets will only last as long as there is confidence in the global economic cycle. 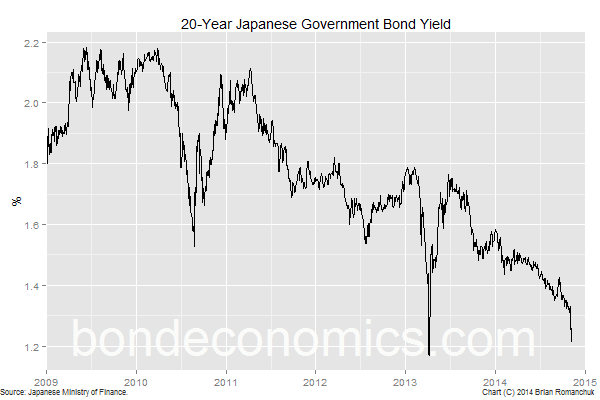 Rising risk aversion will reverse those flows, and the yen will boomerang back towards being overvalued. As the chart above shows, massive purchases by the central bank is eliminating whatever carry that was previously available in the yield curve. The 10-year JGB yield was previously crushed to an insanely low level, and now it is the 20-year bond's turn. Although I am skeptical about the power of Quantitative Easing, it is clear that if the central bank purchases enough of the available duration, yields will adjust lower. (Japan has much less sources of private sector duration than is the case for the United States, so the Bank of Japan has more leverage than the Fed.) At this point, it looks like the '2014 JGB Collapse' has been tentatively re-scheduled for a date in 2015 (stayed tuned for any further schedule changes). 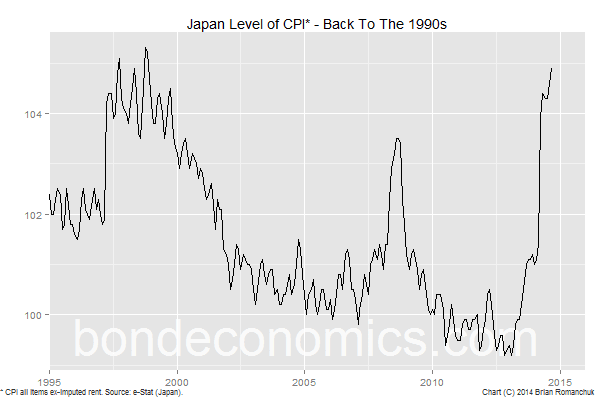 The theory that raising the consumer price level will raise 'inflation expectations' and hence lead to higher nominal GDP growth and possibly prosperity is about to run into the rocks of the inertia of the Japanese economy. This theory is based upon an assumption that businesses must pass through after-tax consumer price increases to wages. Real world businesses appear free to ignore this economic 'law', particularly if the rising prices are fed through to foreign suppliers or the government (that is, for consumption taxes). 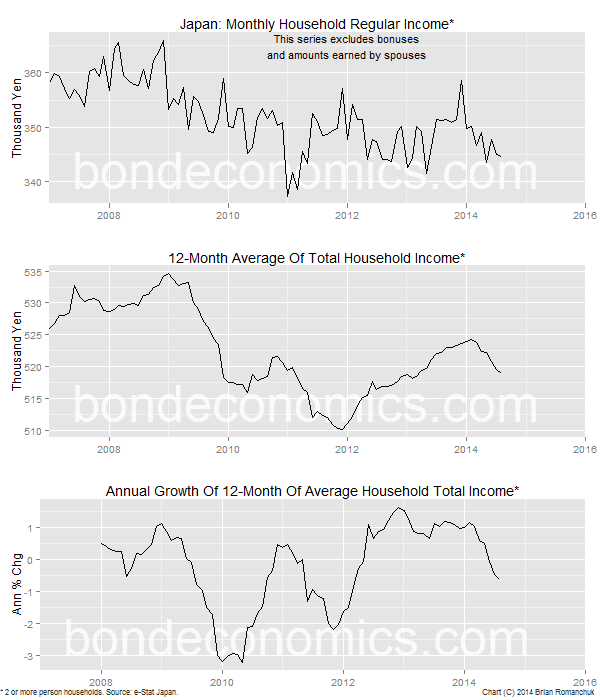 As seen below, the Japanese wage data is showing no tendency to rise (although the data arrives with a considerable lag; the chart data ends in August). Although it will take time for the published wage data to catch up to the latest swoon in the yen, I see no particular reason for wages to start rising any time soon. All that has been accomplished by raising the level of the CPI is to damage the living standards of the Japanese household sector. Since there are no wage gains to ratify higher prices, they will burn out once the one-off effects roll off. Instead, what has been accomplished is mercantilist objective of benefiting export-oriented businesses. The cheaper yen should eventually allow for Japanese firms to gain market share overseas (and at home as a result of import substitution) once the 'J-curve' effect has run its course. That said, I do not see this as important. Although I agree that a cheaper yen benefits future Japanese growth all else equal, all else is never equal. Even if one can 'prove' that a cheaper yen raises growth relative to some baseline using some model relationship, we have no idea whether that baseline growth rate is high or low. If the global economy continues to grow, net exports are likely to benefit Japanese growth. This will happen regardless of the level of the yen (within sensible limits). Conversely, if global growth weakens, net exports will not be enough to save the Japanese economy. The shift in market share due to a weaker yen is unlikely to make that much of difference, unless it really falls out of bed (150 yen to the dollar, or something like that), and the currencies of competitors like Korea do not also weaken similarly.